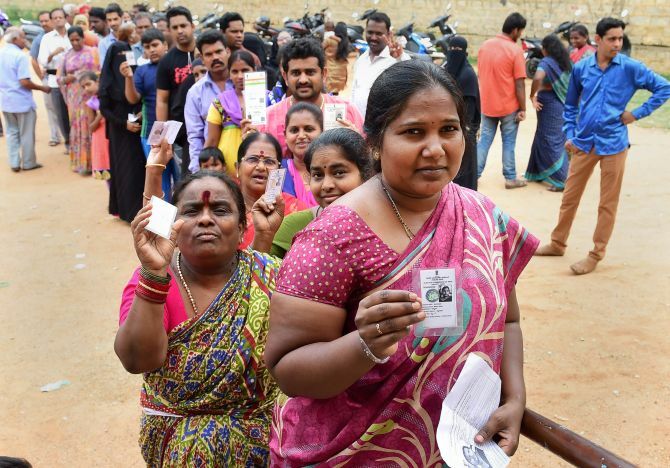 IMAGE: People queue up to cast their ballot for the Karnataka assembly election in Bengaluru, May 12, 2018. The Modi government had an opportunity in the wake of demonetisation to enact a simple, but potentially transformative change. On the pretext of ushering in a digital, cashless economy, it could have insisted that all future donations to political parties would be digital and fully transparent. That would have been a genuine reform. Instead, they went 180 degrees the other way, says Milan Vaishnav, co-editor of Costs of Democracy, a scholarly investigation into how money flows into Indian politics. Vaishnav, director of the South Asia Program at the Carnegie Endowment for International Peace is a sharp observer of Indian politics. He co-edited the book with Devesh Kapur, director, Asia Programs, Johns Hopkins University. In the final segment of his interview with Rediff.com's Archana Masih, Vaishnav speaks about how electoral politics has been overtaken by the rich with 82 percent crorepatis MPs in the current Lok Sabha and the muscling out of the 'little guy' from Indian politics. Your book quotes American politician Jesse Unruh who said 'Money is the mother's milk of politics' -- what are the most damaging consequences that unregulated poll funding has had on Indian democracy? In our view, the deluge of money in politics has at least four potential adverse consequences. First, deep pockets have become a prerequisite for contesting elections on a major party symbol in most states. The talent pool for elected office is being gradually narrowed to the point that only independently wealthy candidates or candidates with wealthy networks will have a realistic shot of becoming an MP or MLA in large parts of the country. Second, when large sums of money are spent on elections, those who spend the money expect to get something in return. For supporters, this could be policy or regulatory favours. For candidates, they need to use the levers of power to enrich themselves and amass more money for the next election. Third, all of this money only serves to further entrench the widespread inequality that exists in India. The wealthy use their wealth to further strengthen their position and the cycle continues. James Crabtree's new book Billionaire Raj documents this in great detail. Last but not least, there is the possibility that democracy itself gets delegitimised. Democracy these days is enduring a bit of reputational damage around the world. This is in no small part due to a perception that the system is 'rigged'. The deep links between money and political power is what dictates an Indian election which makes it a very unequal playing field for those without personal wealth. How will it be possible for the good guys without money to take a shot at politics? Frankly speaking, with each passing year, the aam aadmi is finding it harder and harder to break into mainstream politics -- especially at the state and national levels. Given the premium parties place on self-financing candidates, once you have accounted for the suspected criminals, dynasts, industrialists, and celebrities, there is not much room for anyone else. 82 percent of Lok Sabha MPs are crorepatis. 97 percent of newly elected MLAs in Karnataka are crorepatis; more than 50 percent are worth upwards of Rs 10 crores. It is extremely difficult for the proverbial 'little guy' to compete with these sums. There was the AAP example that enabled ordinary citizens to enter politics but since then many leaders have left the party. What do you think caused this disillusionment? How will this prevent capable candidates from getting into politics? When AAP was born, it represented a truly unique model premised on two key differences with the existing political set. First, it instituted a model of internal party democracy, something that very few parties follow today. Second, it pledged total transparency when it came to political funding. Unfortunately, this initial AAP model fell apart very quickly. Kejriwal soon moved to centralise power in his own hands. As the party struggled to keep up with the rough-and-tumble of Indian politics, it also cut corners on election funding and candidate selection. The truth is that building lasting party structures takes time. Most parties in India prefer taking shortcuts because creating a serious party organisation is a tough, long slog. Political expediency usually kicks in and this is what happened in the case of AAP as well. Political contributions below Rs 20,000 do not need to be disclosed which makes such payments unaccountable. Neither are political parties subjected to stringent audits. What are the big reforms that are needed to clean up money power in politics? That would have been a genuine reform and, in my humble view, it would have sold well with the electorate. Instead, they went 180-degrees the other way. Through electoral bonds, they have legitimised opacity in political giving. Now, any corporation or individual can give virtually unlimited sums to any party without having to disclose a single rupee. To add insult to injury, the government introduced these bonds under the guise of 'enhancing political transparency'. Electoral bonds ensure that funds pass through the banking system, yes. But they are the opposite of transparent because no voter, no journalist, no civil society representative, no one (other than the banking regulator) will be able to trace these payments. Mr Modi has announced a manned space mission, a bullet train, proposed changes in the civil services, demonetisation, GST -- do you feel the BJP under Modi is doing too many things too fast? India is a country in a hurry. I think things have to be done at a rapid pace in order to keep up with the aspirations of the country and its citizens. What I feel is lacking is an overarching framework, especially on the economy. We see highly-touted prime ministerial initiatives (Jan Dhan Yojana or Swachh Bharat) and new schemes (such as 'Modi-care'), but we have not reformed the bureaucracy or implemented the kinds of accountability measures that will ensure that these reforms succeed. Obviously, enacting sweeping change in a country like India is very difficult. There are simply too many 'vet points' -- the courts, civil society, federalism, and so on. But Modi had a once-in-a-generation mandate and the pretext of a sagging economy in 2013-2o14 (not to mention massive political charisma) to be much more ambitious on administrative and economic reform. Sadly, that window has passed. Of course, the government gets due credit for what it has done -- from the GST to bankruptcy and subsidy reform. But, relative to India's developmental needs, I think more could have been done.